My name is Satyendra.I am diagnosed with Myelofibrosis(MF)- Bone Marrow Transplant with 10-12% Cell blast. My intesive chemotherary is going on from Nov 2015 - Jan 2016. After Chemotherapy, once the spil size is reduced, I will go transplant ( Half/Full ) as suggested by Doctor. I am currently being treated with chemotherapy. However I require as BONE MARROW TRANSPLANTATION to improve my chance to cure. As per the Doctors, this condition is curable if treated in accordance to the protocol.The estimated cost for the treatment would be approx. Rs. 50 to 60 lakhs. Though Medical policy is there but it will recover till 10 lacs and I have already spents Around 5-6 Lac towards treatment, diagnosis and investigations for bone marrow treatment. I have been trying to raise money through various means but am finding it a very big challenge to arrange this huge amount. Whatever I had saved has been spent for this treatment. I make a very heartfelt request to kindly help me in treating. I shall be greatly grateful as I am sole earner in my family. I am Boaz Eapen and I met Satyendra who is fundraising for his bone marrow transplant. I met him on the HCL campus where he works. I could comprehend how difficult the situation was for him. However,at the same time, I was inspired by his extraordinary willpower. Satyendra is from Banaras and he has been working at HCL for about 3-4 years. His parents stay in Banaras. He stays in Delhi with his wife Mamta and son Surya Thakur. His son studies in Class 4. Initially, he found it very difficult to tell people about what he was going through. According to him, the service class people have to go through tremendous difficulty to get the right medical treatment as it costs a huge amount of money. Poor people can get a BPL card and the government supports them, rich people have better options, it is the service class people that government doesn’t look after he said. He said that it is very unfortunate that his son had to donate for him as they couldn’t find a donor. Doctors have assured him that he and his son would be safe after the surgery, but Satyendra is more worried about his son. Satyendra is passionate about technology; he reads lot of technical books. He likes to blog about technical subjects like data centre, Cloud System,and providing common Cloud-computing solutions. He did his graduation and diploma from Delhi and masters from Tamil Nadu. “I am the sole breadwinner of my family. If I lose my willpower, my family will also lose hope. I will not let myself down till I am cured and that is my only motto,” said Satyendra. The doctors are not sure as to why the problem happened. The problem is mainly with the white blood cells. Satyendra came to know about the problem when he had a pain around his stomach and the spleen size got increased alarmingly. 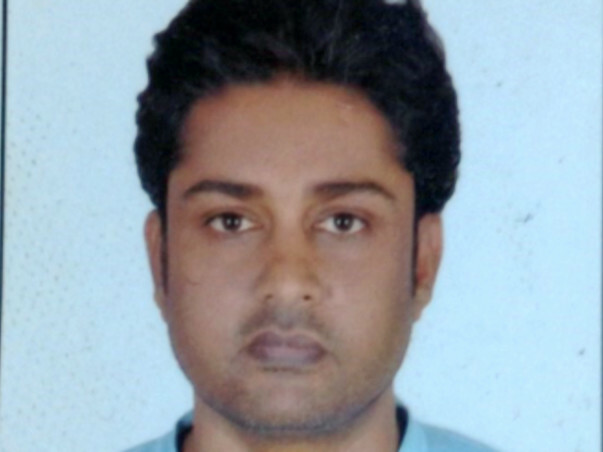 Satyendra found about Milaap while searching for solutions to raise funds on the Internet. 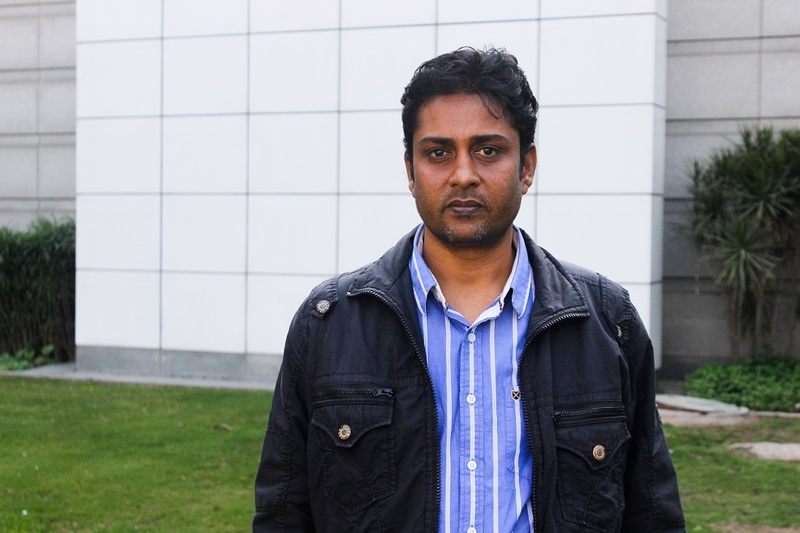 Satyendra was diagnosed with Myelofibrosis (MF) with 6-8% cell blast in June 2015. While looking for the right treatment in various hospitals, his cell blast increased to 12%. 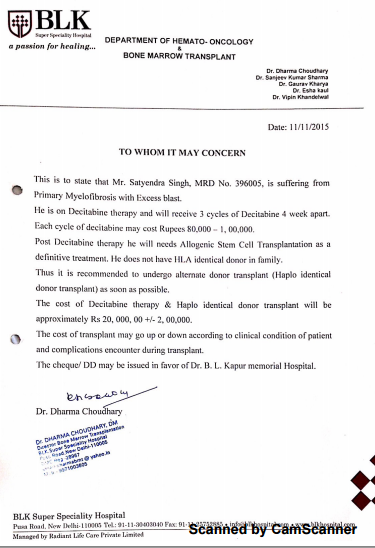 The AIIMS in Delhi denied him treatment saying that they can’t go ahead with an unidentified donor. Owing to the lack of matched sibling donor,he had no other option but to keep looking for other feasible options. After a certain period of time, Satyendra came to know about B.L. Kapur hospital. Fortunately, they agreed to treat him. He started chemotherapy in November 2015. He underwent three chemo sessions in November, December, and January. After which, he underwent biopsy twice. Now, he is waiting for his reports. All the required pre-sessions and tests for his transplant have been done and he will undergo the procedure soon. His 9-year-old son, a courageous lad will be donating the stem cells required in the procedure. Satyendra would have undergone the surgery earlier if he had the financial resources. However, the dearth of the resources got in the way of his treatment, which is why he decided to opt for a campaign and raise funds for it. He was able to raise a decent amount of money in a period of 3-4 months. I asked him if he would like to say something to the people who have supported him. He said that more than 450 people have helped him in his time of need. He doesn’t even know all of them. However, they went ahead and did this because they’re driven by humanity. “In India we talk so much about development and politics but we don’t actually do much for the people. We have a very strong brainpower in India but we are not doing as much as we can. Education and health are such areas where there should not be any constraint or challenge but money is the only factor that decides everything, that should not be there.” Doctors used to be called equivalent to gods but now it is all business, he said. He did a lot of research over the Internet. His friends told him to visit Dr. Dharma Chowdhary in BLK hospital and Satyendra felt comfortable with the doctor as he understood his problem very well, his talking made Satyendra comfortable and he helped him in taking the decision. In India the budget for health per person is very low compared to developed countries, he said. He works from home mostly nowadays and his team is very cooperative. He wants to keep working to keep the negative thoughts at bay. Satyendra will be hospitalized for 30-40 days and will be under study after undergoing the surgery. He will have to be at home for 3-4 months after that He will try to work from home during that period. His health insurance from HCL will cover some money and his team has also promised to help him. He hopes for the best.